André Greipel (Lotto-Soudal) continued his dream season Sunday with a sprint win at the Vattenfall Cyclassics, the lone WorldTour race in Greipel’s home country of Germany. The 33-year-old beat 2014 winner Alexander Kristoff (Katusha) and Giacomo Nizzolo (Trek Factory Racing) to the line in Hamburg, adding a big one-day victory to the quartet of Tour de France stage wins he earned in July. Although the race typically ends in a sprint, a number of riders made bold attempts at long-range glory on the road from Kiel to the Hamburg finish. Jan Barta (Bora-Argon 18), Matteo Bono (Lampre-Merida), Alex Dowsett (Movistar), and Martin Mortensen (Cult Energy) formed the day’s early breakaway, which was given a few minutes of breathing room before being gradually reeled in. Despite the best efforts of several late attackers, including Linus Gerdemann (Cult Energy), Julian Alaphilippe (Etixx-Quick-Step), Dylan Teuns (BMC Racing), and Sep Vanmarcke (LottoNL-Jumbo), everything came back together for a bunch kick, though not before Mark Cavendish (Etixx-Quick-Step) crashed out of contention inside the final 10km. Katusha drove the peloton into the finishing straight, but the team’s leadout faded with several hundred meters still to go, leaving Kristoff alone at the head of the race. He opened up his sprint early, and Greipel flew past to take a clear victory. 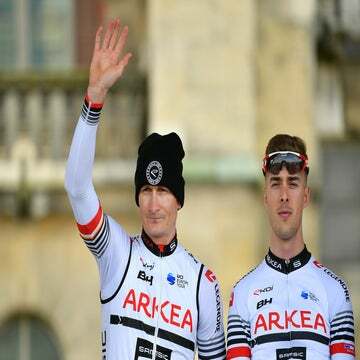 It was Greipel’s first Vattenfall Cyclassics wins after several near misses in his career, including back-to-back second-place finishes in 2012 and 2013. Kristoff said he was disappointed to have missed the victory by half a wheel in what he called a “crazy fast” sprint, but added that he’d get a shot at vengeance down the road.